Gur and colleagues used a computerized 1-hour battery, administered to a prospective cohort of more than 9000 genotyped and psychiatrically phenotyped youths aged 8 to 21 years, to demonstrate the feasibility of creating “growth charts” of neurocognition that can identify developmental delay in children as young as 8 years with psychosis spectrum features. The delay is less severe in females than in males and more severe in children who endorse significant psychotic symptoms than in those with mild symptoms. Fears and colleagues investigated quantitative measures of temperament, neurocognition, and brain structure acquired from multigenerational families with heavy genetic loading for bipolar disorder in genetically isolated populations of Latin America (N=738). Neuroimaging phenotypes, particularly prefrontal and temporal cortical thickness, represented the most promising candidate traits for genetic mapping. Sarrazin and colleagues assessed the integrity of brain white matter using tractography in a multicenter sample of patients with bipolar I disorder and healthy subjects. Patients with bipolar disorder had a lower integrity of interhemispheric, limbic, and arcuate tracts when compared with controls. Abnormalities of the corpus callosum were more pronounced in patients with a history of psychotic symptoms, suggesting a role for interhemispheric dysconnectivity in psychotic features in bipolar disorder. Hatta and colleagues examined whether ramelteon, a melatonin receptor agonist, is effective for the prevention of delirium in a multicenter, rater-blinded, randomized placebo-controlled clinical trial. Ramelteon was associated with lower risk of delirium, even after controlling for risk factors. Ramelteon administered nightly to elderly patients admitted for acute care may provide protection against delirium. Meara and colleagues examined hospital discharges among 19- to 25-year-olds with behavioral health diagnoses following Massachusetts’ 2006 health reform. Although insurance coverage expanded most for young adults following reform, use of expensive hospital-based care did not rise. Encounters for young adults with behavioral health diagnoses, driven by patients with substance use disorders, grew more slowly in Massachusetts than other states following reform. Lee and colleagues assessed the association of amyloid burden and cognitive decline in patients with subcortical vascular mild cognitive impairment (MCI) (n = 67) and patients with amnestic MCI (n = 45). In the patients with subcortical vascular MCI, amyloid burden was negatively correlated with multiple cognitive domains but only with memory domain in the patients with amnestic MCI. A synergistic effect of ischemia and amyloid burden was found in the visuospatial domain, but not in other cognitive domains. Eraly and colleagues have found in a cohort of combat zone–deployed soldiers that predeployment C-reactive protein (a marker of peripheral inflammation) is associated with postdeployment posttraumatic stress disorder symptom emergence. These findings suggest that peripheral inflammation may increase the vulnerability to developing posttraumatic stress disorder and thus have potential implications for the prevention of this disorder. D’Onofrio and colleagues examined the association between paternal age at childbearing and psychiatric and academic problems while controlling for statistical covariates and comparing differentially exposed siblings, cousins, and first-born cousins in a large population-based Swedish sample. The analyses found that advancing paternal age was associated with increased risk for every index of psychiatric and academic morbidity, with the magnitude of the risks being as large as or larger than previous estimates. In 1 401 698 Swedish individuals, Kendler and colleagues showed that an objective definition of peer deviance (PD) strongly predicted future drug abuse. The predictive power of PD was only slightly attenuated by measures of community deprivation, collective efficacy, or family socioeconomic status. Individuals at high genetic risk and those with parental divorce were both more sensitive to the pathogenic effects of high PD environments. Many studies have linked receipt of injury compensation benefits to poor long-term recovery, but the nature of this relationship is not well understood. 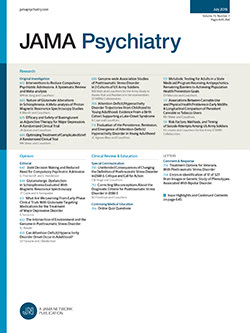 In a prospective cohort study of 332 claimants to transport accident programs and workers’ compensation programs in Australia, Grant and colleagues found that those who experienced high levels of claim-related stress had relatively poor outcomes (high levels of disability, anxiety, and depression; lower quality of life) 6 years after injury.